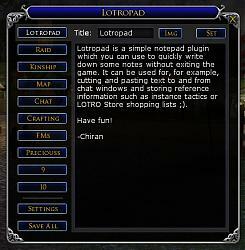 Lotropad is a simple notepad plugin which you can use to quickly write down some notes without exiting the game. It can be used for, for example, cutting and pasting text to and from chat windows and storing reference information such as instance tactics or LOTRO Store shopping lists . Big thanks to Vevenalia for the French translation! To load the plugin type /plugins load lotropad. You can show and hide Lotropad window by clicking the Lotropad icon (visible by default). Button can be moved by dragging it. Position of the button is saved when clicking 'save all'. Right-click the Lotropad icon to switch between normal and mini mode. In the mini mode, everything else is hidden except the text of the note. To save your notes click Save all, this will save the contents of all your notes. The write procedure is delayed so it might take a moment to be executed. Notes are currently saved per account which means that all of your characters on all servers can access them. Note that pressing Set will only set the title and text for the current note. However, this is also done automatically as you click through your notes. Click settings to adjust the font size (main text field only), window opacity, and window visibility on load. You can set a background, such as a map or tactics diagram, for a note. First copy the image (jpg or tga only) to images folder under the Lotropad plugin folder. Then click Img and type the image filename to the text field. Clicking Set image sets the image as the new background and Clear image removes the background image. When the whole note does not fit the window, the position of the scroll bar always moves to the end when the note is opened. Background images might not be visible with some skins. This depends on how the alpha channel is set in ArtAssetID "black_translucent" image. French translation, big thanks to Vevenalia! Can confirm Esc doesn't work (the in-game menu opens, but Lotropad doesn't disappear). In the same idea, I'd like for keyboard shortcut to work, like ctrl+Z to cancel last change, or ctrl+Y to re-do it. Don't know if it's doable, or even if people would find it useful, but would it be possible to close the window using the esc key? Actually it should work even now? Although esc does also display the normal in-game esc menu, which is inconvenient. Not sure if it's possible to prevent that, probably not. You always remember absolutely everything you could possibly need across all your alts, right? So you remember what type of armor(s) your Burglar can wear? Or whether your Jeweler can make T6 stuff? Can your Champion use that random drop? Which character is holding all those Essences you've been collecting? Well, perhaps something like this info kept permanently (and periodically updated) on one of the tabs in LotroPad can help. The "Cook & Farmer" part tells me which profession(s) my character performs (not all my characters are trained up on all 3 professions - for instance; that is what the Tailor entry means he's a T1 and doesn't need any mats). The "Yeoman" tells me the name of this profession combo so that when I need to get a new tool for the character I remember to get the right one! The "Heavy" part is the highest value armor the character can use. Then I list the professions known (cause I don't ever remember this) the Tier level and any mats needed (in this case, I'm maxed; otherwise I might have "T7 Riddermark" for Tailor letting me know tier # and the hides I need). "Guilded" lets me know if the character is a Guild member and has access to the Guild Recipes. "Inventory" and "Vault" both show the number of slots the character has available, and shows if they're maxed out. Good to know if LotRO has a sale. Finally I list any class of items that the character is storing in it's vault, like Essences, so that when I need to find an Essence, I don't need to hunt through all of my characters. While you can use other plugins to keep track of inventory, perhaps you don't want the overhead and delay while that plugin does its thing. This allows a quicky way to handle things, knowing in general which character to search - but at the cost of not being able to know exactly what the character has stored. Although there is no entry for it above, you could keep track of any Factions that can still use Rep Items. Just don't get too "columny" because LotroPad uses the game font - which is a proportional font. So nothing will line up perfectly; a pixel or three, here or there, is as close as you'll get. This effort is sometime made easier by creating it in another text editor for initial layout and ease of use. Then copy and paste into LotroPad and adjust as needed. Try not to get too frustrated. Last edited by Modnar : 03-26-2015 at 02:59 PM. Can anybody tell me what I can do to solve this problem? Issue should be resolved if you delete LotropadSettings.plugindata. This doesn't delete the data, but it resets window position and such. The file is at 'The Lord of the Rings Online\PluginData\<lotrouser>\AllServers\'. Unload the plugin first before deleting, or do it when the game is not running. Since some months, I have the problem, when opening Lotropad, that the upper third of the Window, is beyond the upper screen edge. Therefore I can't move it or close it and I can not reach the first two notes. I have already tried to change the solution of the game and of windows, but that didn't help. In the beginning just the Top of the Lotropad window was beyond the screen, I couldn't move and close it, but I could use all notes and switch it on and of with the addon manager. But since then it has moved up. .gs Online\Plugins\Chiran\Lotropad\LotropadWindow.lua: 622: Failed to load background image. It looks like one of the notes has a background image set and for some reason it cannot find the image file. 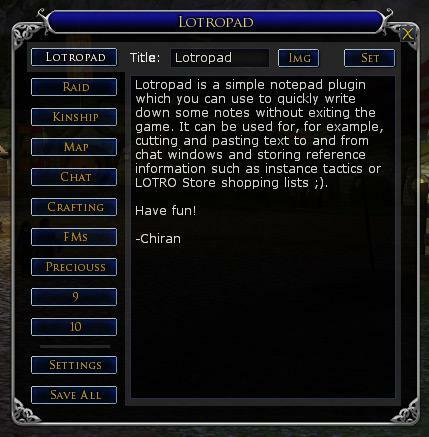 So you should copy the image to \The Lord of the Rings Online\Plugins\Chiran\Lotropad\images\ directory. Or you can also fix it by manually editing \The Lord of the Rings Online\PluginData\chiraneu\AllServers\LotropadData .plugindata. There you need to find a line with the broken image link. Where YourControl is your control and YourImagePath is the path to the image (or resource ID). This way, if the image does not exist, "success" will be false after the call - you can choose to simply ignore this or add a line that outputs a message to the user indicating the error but allows the plugin to continue functioning. Last edited by Garan : 05-18-2013 at 09:21 AM. Let's try to crack this thing then . Yes, it looks like you did set a background image for a note but then the image file was removed while the link to the image still remains. And on my part the code is not so forgiving in that case :/. There are a couple of options I guess. One is to comment that line (199) in the code by adding double dash in front of it (--). That pretty much disables background images and the plugin should start ok.
Maybe better is to open your lotropad data file and find where the image link is and try to add an image with the same name again under the images directory. The file should be at Lord of the Rings Online\PluginData\<lotrousername>\AllServers\Lotro padData.plugin. Open that file with notepad and find a line with ["ImageFile"] = "someimage.jpg". So check the filename you found and make 'images' directory again and place an image with that filename there. Or you can just edit line that by removing the image filename while leaving the "" characters there (to be ["ImageFile"] = ""), and then save the file. The file format is very strict and breaks easily so be careful when editing it. You have to find all lines like that to and do the same with each of them. I hope this helps and the situation is resolved . PS I think I should add I use the Lotro Plugin Compendium (LPC) and downloaded lotropad via that app!! Last edited by shirlzknight : 05-18-2013 at 06:02 AM. Thank you so much!!!! It's finally working. I just had to log out of the game and back in again. Last edited by Miss Night Owl Featherton : 02-03-2013 at 02:36 AM.